I recently found the pattern for this little cutie and couldn’t help myself. Luckily, I had suspected one of my closest friends of being ‘with child’…and on the night I put the finishing touches on my little friend, I got a delightful call telling me she was, in fact, carrying a little lima bean. I will add the pattern with pictures shortly, please stay posted to get it. This was possibly the most simple pattern I have ever done and one of the easiest stuffed animals I’ve made to piece together properly after. It really only took me a few nights in total to complete this and was not difficult to complete. You can find the original pattern here. 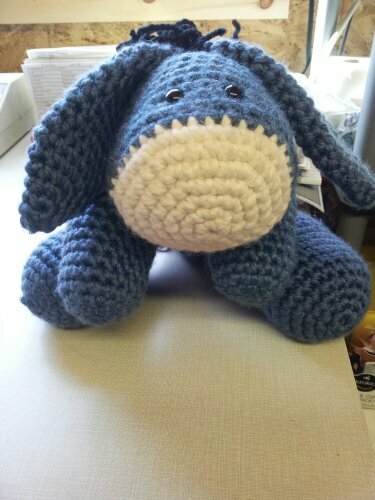 I finally have a chance to add the pattern for Eeyore! I hope everyone enjoys making him as much as I did! Good luck, and if you need any help or have any additional questions feel free to ask! 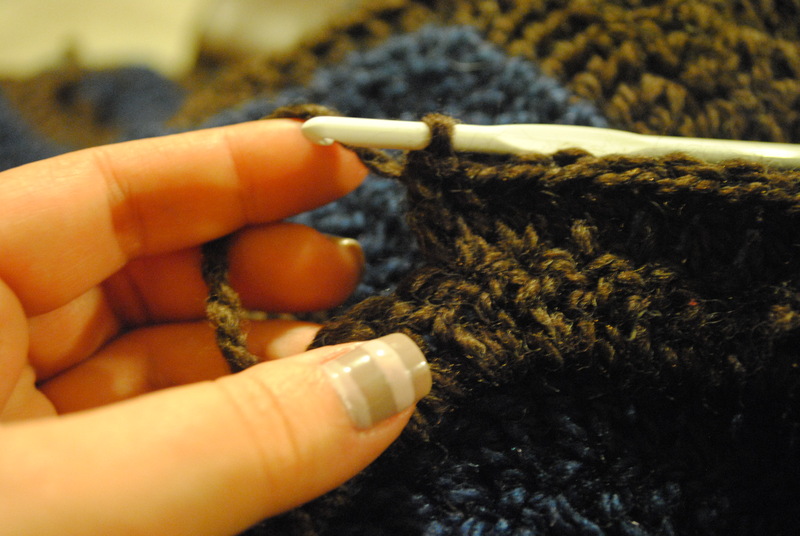 Row1: Ch2, in first stitch, sc6. Now you should stuff the body. Leave a very long tail for sewing later on. You may need to add more stuffing at this point. Leave long tail for sewing later on. Fasten off, lave tail for sewing later on. Fasten Off, leave long tail for sewing later on. Skip 6, sl st back through all stitches and fasten off. Cut black yarn and fasten to end of tail without loop. Tie pink ribbon around the tail and then you will use the loop to attach to the body. Now you will need to attach all the limbs to the body. This is simple. You can sew them on with the extra yarn you left at the end of each set. Good luck! I’ll be making another one soon, I’ll be sure to add plenty of photos so that you can easily see how everything should look. Thanks for reading! 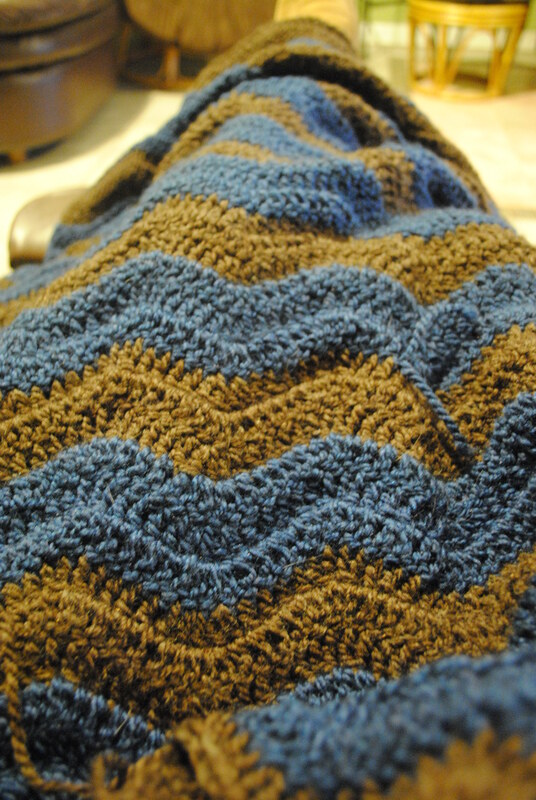 So it took me a really long time to get the hang of crocheting and I FINALLY found a good tutorial that not only explained, in detail, each stitch, the abbreviations, and had great pictures. At the end, she showed you the whole pattern and I was able to read the crazy lingo because she had done such a great job with the step by step. She was so informative and it was laid out so well that it was the first time I had been able to understand anything. 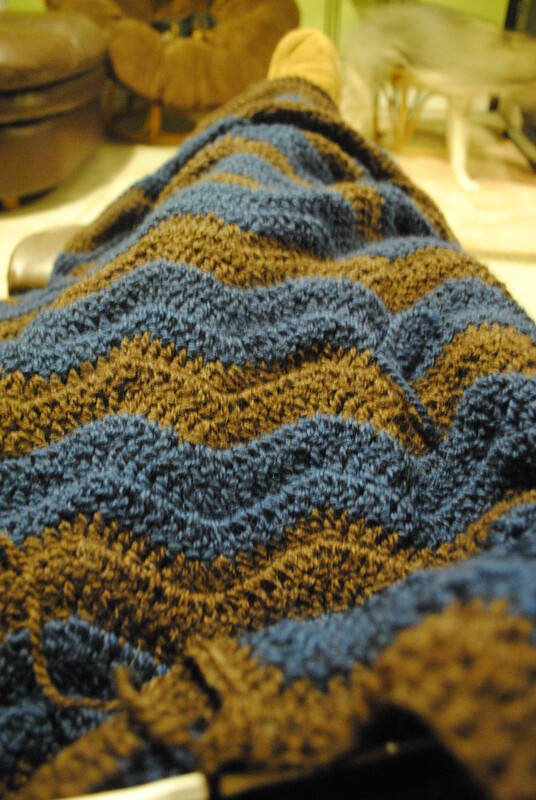 I have been making this beautiful blanket, I will post pictures in a few, and I am almost halfway done with it. It is coming out fantastic, although I have had my share of mistakes along the way! I had a problem last night and ended up crying and almost giving up and ripping apart the whole first section of it. Well, thanks to Ravelry.com and the wonderful people on there, I had about 30 people helping me and talking me through it. I finally fixed it and I’m back on track! Seriously, these lovely people saved my life! 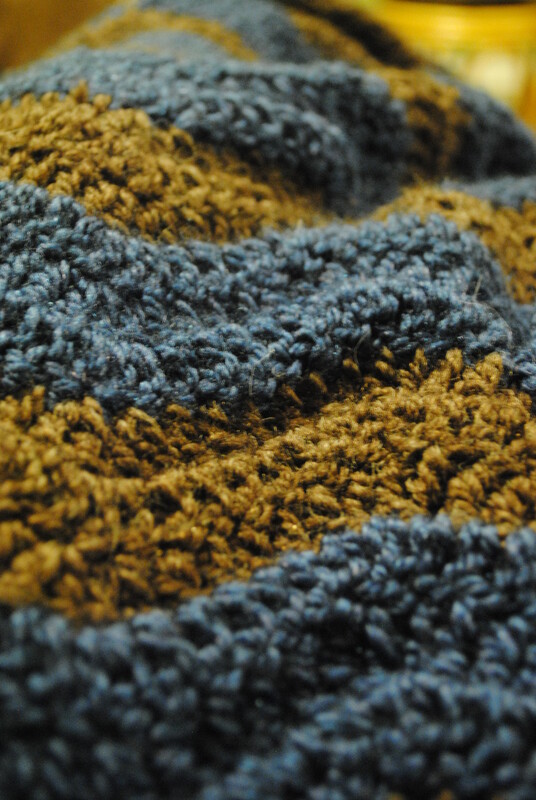 I have spent so much time and money on this blanket and it’s just so pretty and soft and fantastic that I really didn’t want to give it up…my poor husband last night was trying everything to make me feel better. He wasn’t making sense, but he was trying to help me fix it! What a wonderful man he is! You can view the original tutorial and pattern here. I will eventually get around to posting my own tutorial, as I did change the pattern a tiny bit, although she did do a wonderful job with it. I found this idea once again, on Pinterest. Here is the link. I thought it was cute, and naturally I flipped my computer around for the tenth time that night and showed my husband. He usually just glances over and says cool and goes back to watching Pawn Stars. Well this time, he said, “Oh wow! That’s a good idea! We could do that!”. I was SHOCKED. So of course, I jumped right up and grabbed the candy jar and dumped all the candy into a bowl. I haven’t put a tag on it yet, and we have only put two notes in it, but what can I say, it’s not a habit yet. The idea is to start in January and each day that something good happens, no matter how small and insignificant, you write a little note about it and stick it in the jar. Then, at the end of the year on New Years Eve, take it out and read all the wonderful memories from the year before. A friend also gave me the idea to try the same thing with nice things about each other or silly little reasons why we love each other, and then when we inevitably go through a rough patch in our marriage, or start to forget our priorities, we read all the reasons we love each other and maybe it will help us out. I thought we could do a little of each and whichever comes first will be our day to reminisce on what a beautiful year we’ve had together. 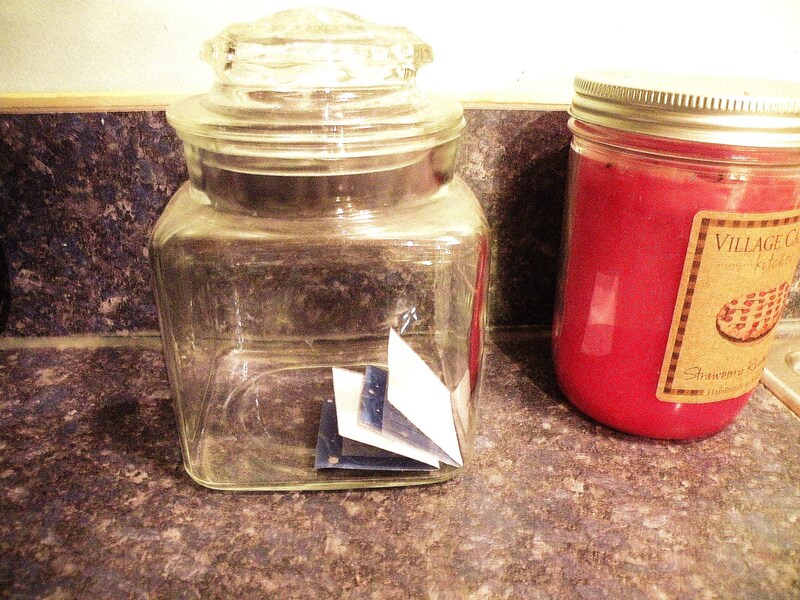 Dress it up, mine is boring for now, but I hope to get a better jar at some point. 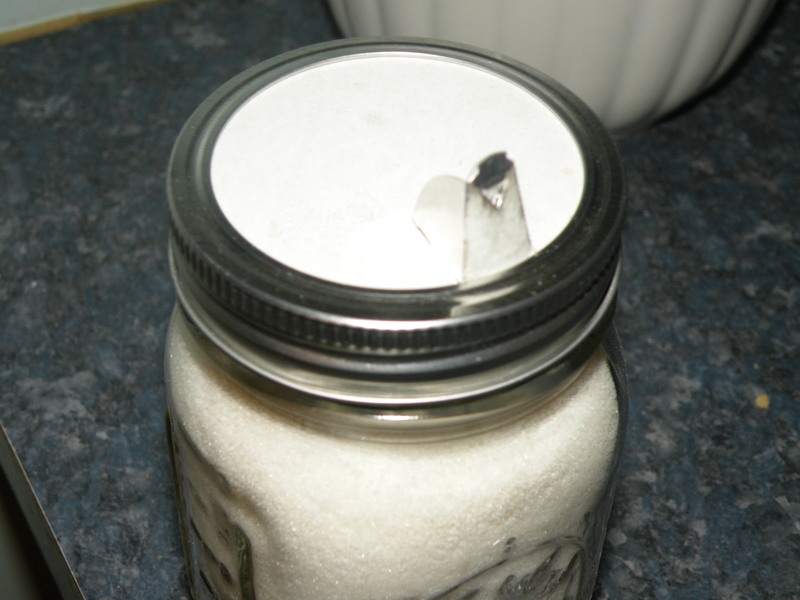 One of many small projects…A Sugar Pourer from a Mason Jar! So, of course I found this idea on a link off of Pinterest. You can find the link here. I encourage you to check it out because it is a list of 100 things you can do with household items, and let me tell you, there is some cool stuff on there! Anyways, I was looking through this list one night in bed and I got SO EXCITED about some of them that I jumped right up and went downstairs to do it! So basically you take one of those round paper/cardboard containers of salt with the pour spout on top, a mason jar, and scissors, and get ready for the greatest invention EVER! First, before I continue, I want to explain to you why exactly it’s so great. It may seem pretty mediocre, but the way my kitchen is set up makes this better. 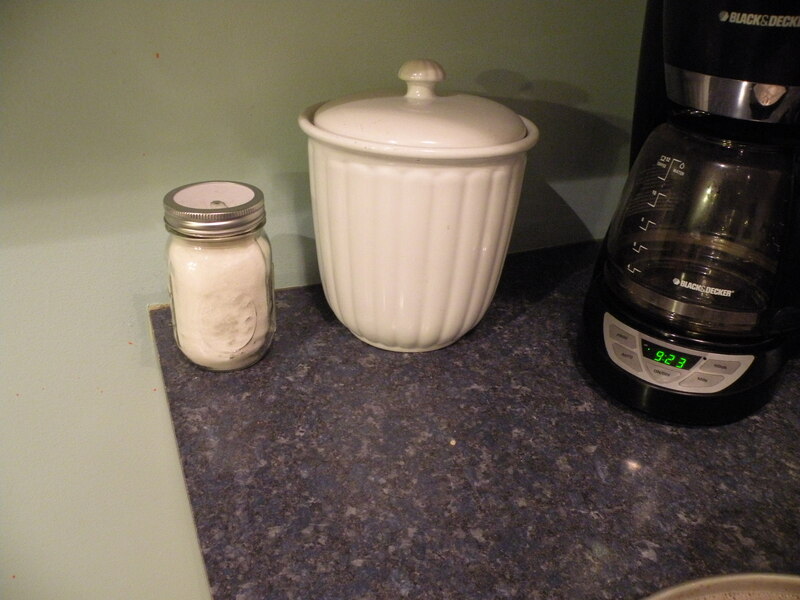 My canister with flour, sugar, etc for baking are next to the stove and my coffee stuff is all on the complete opposite side of the kitchen way in the corner. 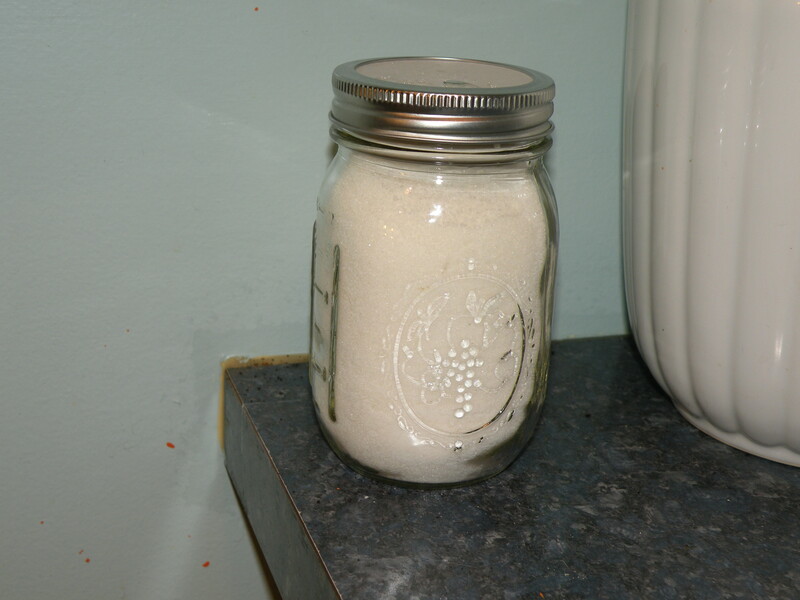 So, not only would I have to carry my steaming hot coffee all the way to the stove area, but I used up my baking sugar so quickly! 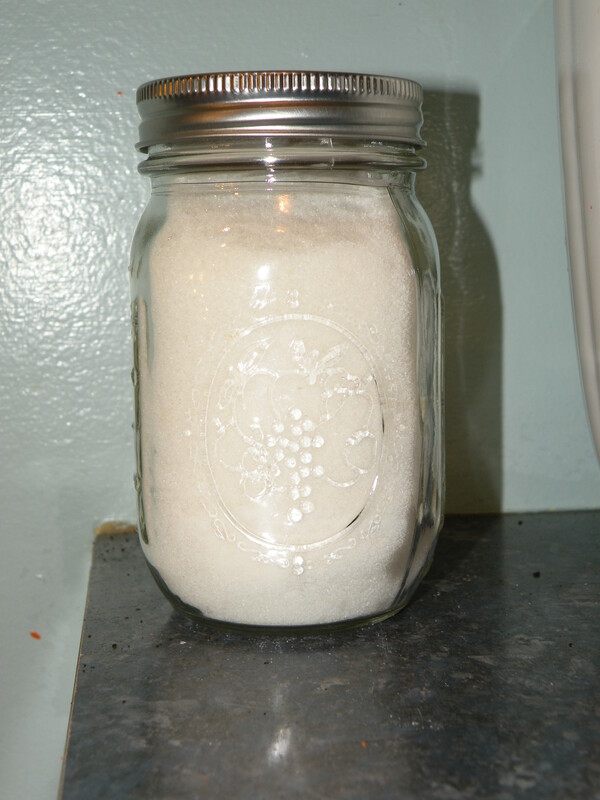 Then, I would spill sugar all over the counter every time, (because obviously I was so excited for coffee that I sloshed sugar everywhere trying to get it to the cup as quickly as possible) my counter was NEVER clean of sugar. Now, I have everything right in a nice little coffee corner and easily accessible, fully stocked baking supplies, and the best part, NO MESS! Okay, now that that’s done, I can finish the quick process of happiness. 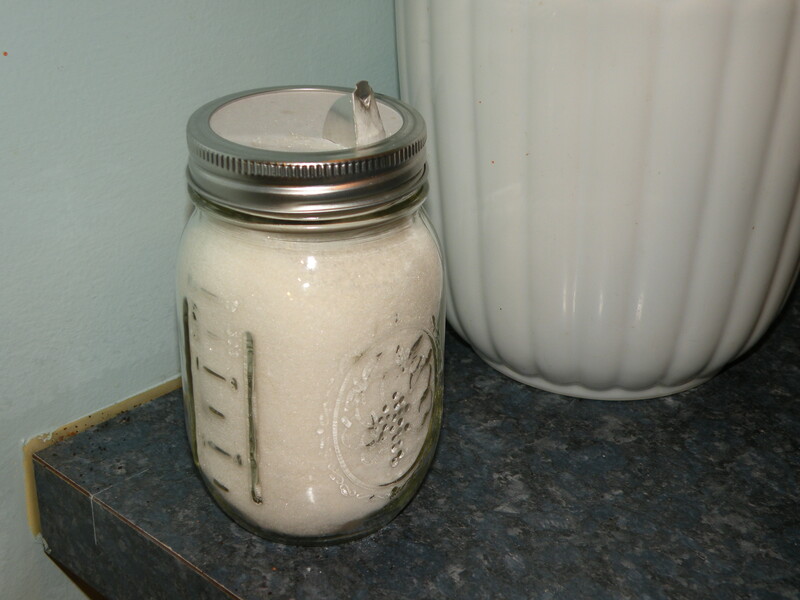 So peel off the top on the salt container, it should be fairly easy, but I had to use a knife to un-stick the glue. Then, I took the lid from the mason jar, placed it on top of the flat top, and traced with a pen around the outside of the lid onto the cardboard top. Remove the lid, and cut around the pen line. Now, I had to trim it down a little to fit inside the lid. I wanted it to be snug, you should be able to push it in and hear it almost click into place nice and snug, but loose enough that it’s flat. It should stay in without movement. Also, you want to be sure that you have left enough room for the spout to open and close comfortably. Once you have done this, you’re done! Now all that’s left is to fill it with sugar, (or whatever else you want!) and have your pouring fun! Here are some photos of my finished product! My little coffee corner 🙂 It makes me so happy!! If you want to dress it up a little, add a label! You can put anything you want in it.